BEAT esports is partnering with Cooler Master and we're giving away a CPU Cooler, a mechanical gaming keyboard & an RGB gaming mouse! To enter, grab your free entries by following few simple steps listed down below! 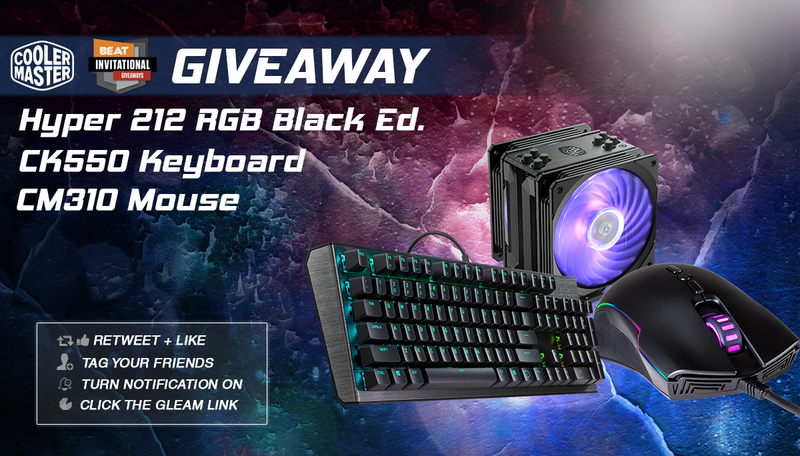 3 winners will be selected to receive 1 of the following: Hyper 212 RGB Black Edition Cooler CK550 Mechanical Gaming Keyboard CM310 RGB Gaming Mouse Winners will be selected on March 23th at 11:59pm EST and will be contacted via e-mail or Twitter. Good luck!